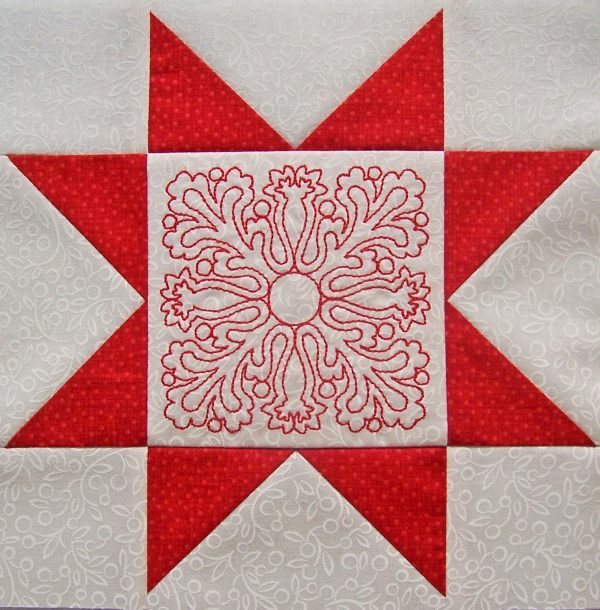 Author, teacher, fabric designer and BERNINA Ambassador Nancy Mahoney shows you how to create an Aurora Feathered Star quilt block in this tutorial. 1. Layer 1 white 9″ square and 1 red square right sides facing up with raw edges aligned. Cut the squares in half diagonally. 2. Cut 2-1/4″-wide strips, measuring from the center cut. Do not discard the small triangles! 4. 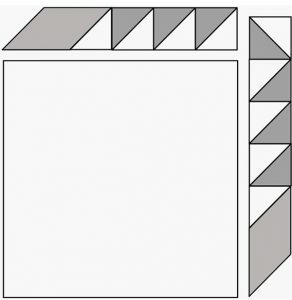 Beginning at the lower left corner, align the 45° line on the square ruler with the seam line. Each unit will require 4 cuts. The first and second cuts are along the side and top edges of the ruler. Cut the 2 sides and remove the unit from the strip set. 5. The third and fourth cuts are made along the remaining 2 sides. To make these cuts, rotate the segment and align the cut edges with the required measurement on both sides of the ruler and the 45° line on the seam. Cut the remaining 2 sides of the unit. 6. 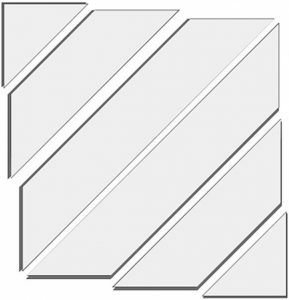 Make a total of 6 strip sets. 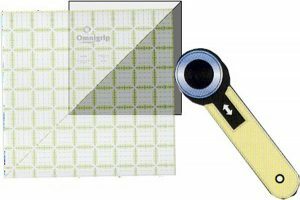 Cut (28) 1-1/2″ x 1-1/2″ units and label as A. Cut (36) 1-5/8″ x 1-5/8″ units and label as B. 1. Fold the red 1-1/2″-wide strip in half, wrong sides together. 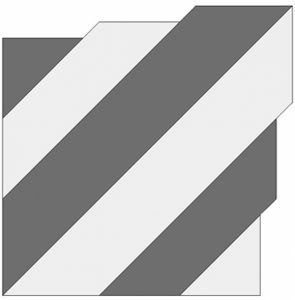 Using a ruler marked with a 45° line, trim the end of the strip at a 45° angle. Measure 1-5/8″ from the freshly cut edge to cut 2 diamonds. Cut a total of 4 C diamonds and 4 reversed C diamonds. 2. 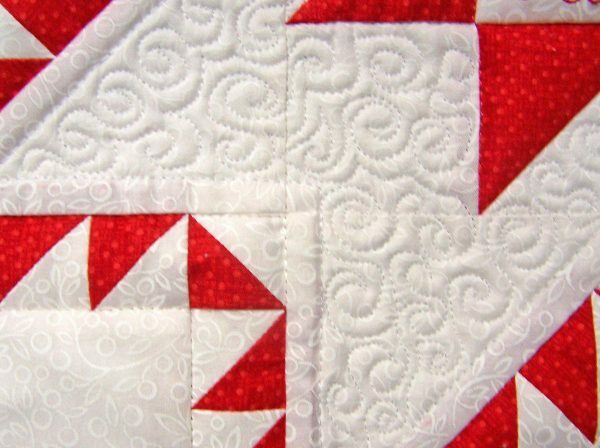 Sew a red C diamond and a white A1 triangle together as shown to make a diamond unit. Sew a red CR diamond and a white A1 triangle together to make a reversed diamond unit. Press seam allowances toward the diamonds. Make 4 of each unit. 3. To make the feather rows, join 1 diamond unit and 3 A triangle-square units to make a short feather-row. 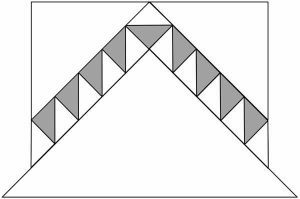 Join 1 reversed diamond unit and 4 A triangle-square units to make a long feather-row. Make 4 of each unit. 4. 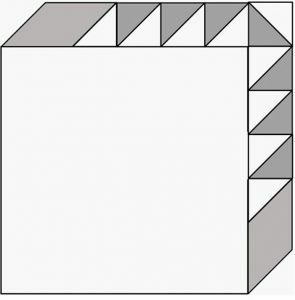 Each triangle-square unit should measure 1″ from seam to seam. On each diamond, measure 2-7/8″ from the seam line to the tip of the diamond (see diagram following step 5); trim off the tip of the diamond. 5. With right sides together, sew a short feather-row to a white D square. Sew a long feather-row to an adjacent side of the square. Press all seam allowances toward the square. Make a total of 4 A units. These units are constructed using a partial seam technique. 1. 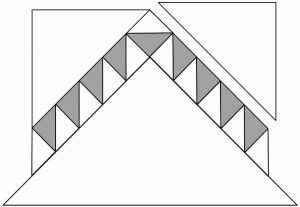 To make the feather rows, join 4 B triangle-square units and 1 white B1 triangle to make a short feather-row. Join 5 B triangle-square units and 1 white B1 triangle to make a long feather-row. Press all seam allowances toward the dark triangles. 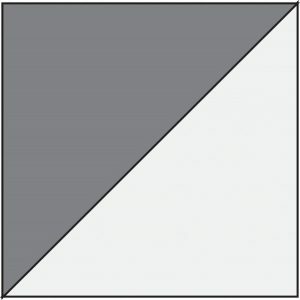 Each triangle-square unit should now measure 1¹/8″ from seam to seam. Make 4 of each unit. 2. 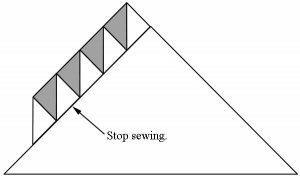 With right sides together, sew a short feather-row to a white E triangle stopping about 1″ from the end of the feather-row with a backstitch. Sew a long feather-row to an adjacent side of the triangle, stopping about 1″ from the end of the feather-row with a backstitch. 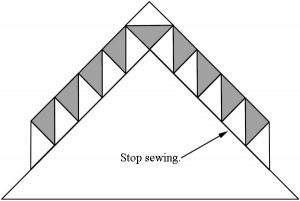 Press all seam allowances toward the triangle. 3. 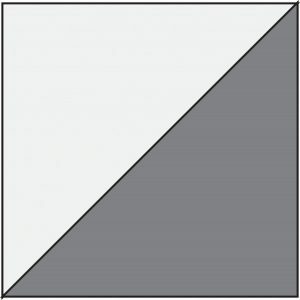 To complete unit B, sew 2 white F triangles to the unit as shown. Make 4 B units. 1. Attach the embroidery module. Install an embroidery needle and an embroidery foot. Thread the machine with red thread. Select an embroidery design; on my B 780, I selected BD554 and reduced the size to 92 x 92 mm, or 84% of the original. Refer to the manual for your machine for help setting up your machine. 2. Place the white I rectangle on top of the stabilizer. Then place the layered rectangles in a medium hoop. Embroider the design. 3. Follow the manufacturer’s instructions for removing the stabilizer. 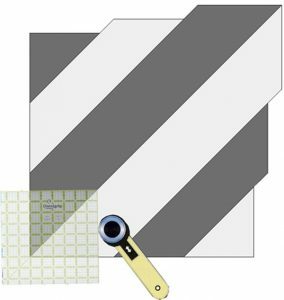 Centering the design, trim the white rectangle to measure 4-1/2″ x 4-1/2″. 4. Draw a diagonal line from corner to corner on the wrong side of each red H square. Layer a marked square on one end of a white G rectangle, right sides together. Sew on the marked line and trim the excess corner fabric leaving a ¹/4″ seam allowance. Press the seam allowances toward the resulting triangle. 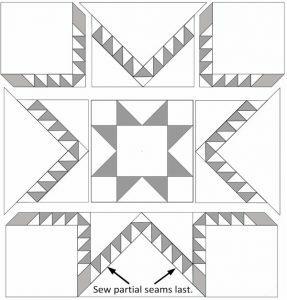 In the same way, sew a marked square on the opposite end of the rectangle to make a flying-geese unit. Make 4 units. 5. 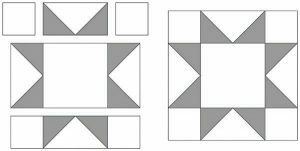 Lay out the flying-geese units, 4 white H squares, and the embroidered square. Join the pieces into rows and then join the rows to complete the block. Make 1 block. Arrange 4 A units, 4 B units, and the Sawtooth Star block in 3 rows as shown. 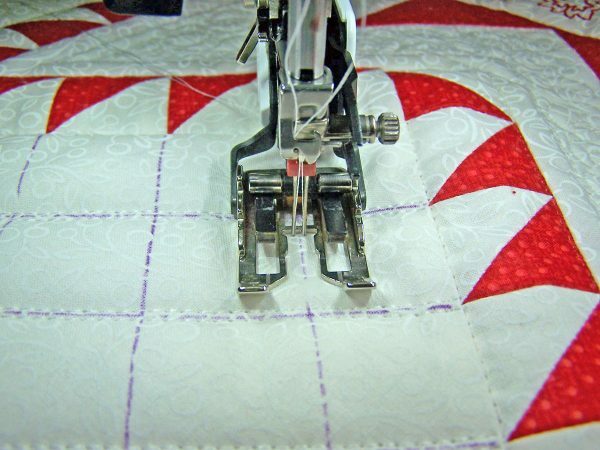 Join the units in rows sewing the partial seam last. Join the rows, completing the partial seams last. 1. Measure the center of the star block from side to side. 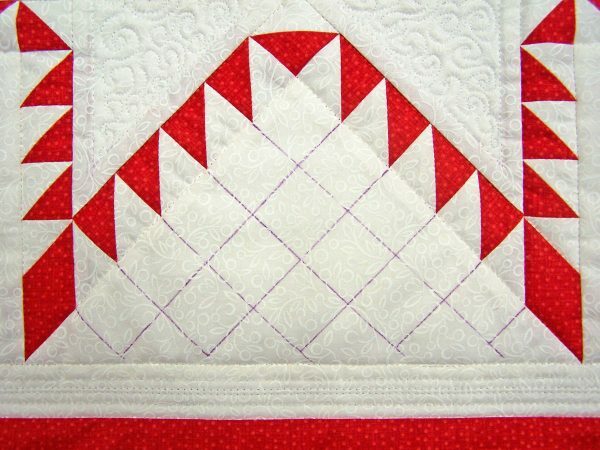 Cut two white inner-border strips to this length and sew them to opposite sides of the block. 2. Measure the center of the star block from top to bottom, including the side borders. 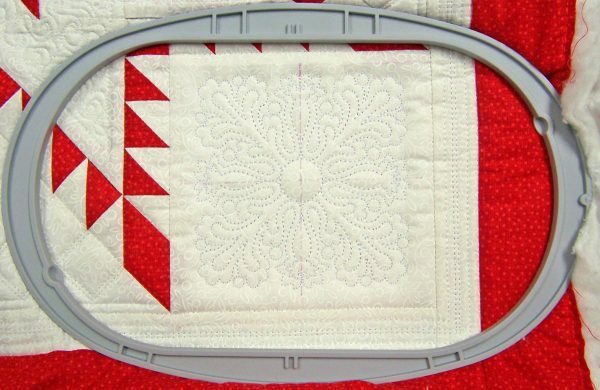 Cut two white inner-border strips to this length and sew them to the top/bottom of the block to complete the inner border. 3. Repeat steps 1 and 2, using the red outer-border strips to attach the outer border. 1. Layer the quilt top, batting and backing; baste. I used a walking foot, quilting needle, and monofilament to stitch-in-the-ditch. I changed to white thread and stitched straight lines in the inner border. 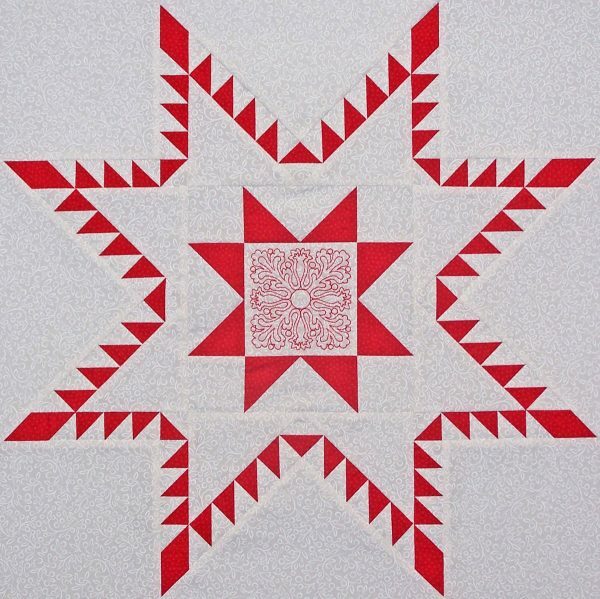 White thread and a free-motion foot were used to quilt a tiny swirl design in the large white star. TIP: Reduce the top tension when using monofilament. I set the tension to 1.5 on my machine. Be sure to return the tension to the normal setting when using regular thread. 2. To quilt a diagonal grid in the large white triangles, I marked lines using a removal marker. 3. Then, I installed a twin needle, a walking foot, and white thread. Use the marked lines as a guide to stitch the grid. 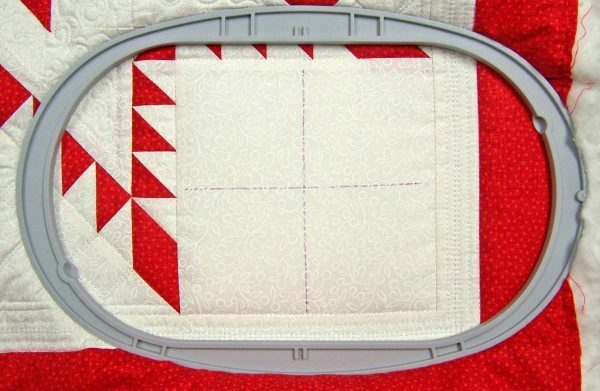 TIP: Be sure to use a 5mm or 9mm stitch plate when using a twin needle. 4. 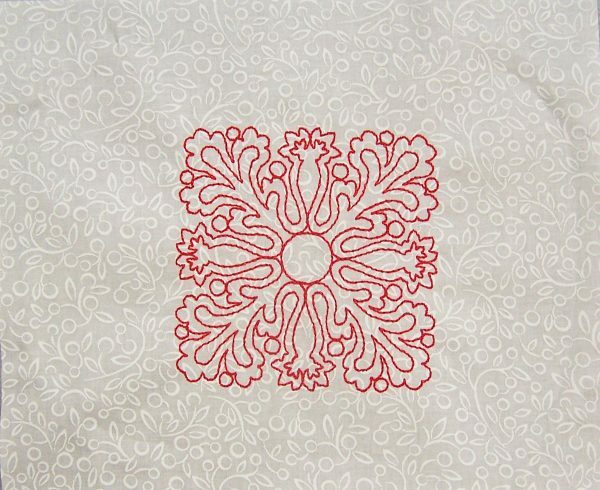 To quilt the large white squares, attach the embroidery module. Install an embroidery needle and an embroidery foot. Thread the machine with white thread. Select an embroidery design; on my B 780, I selected BD554 and increased the size to 115 x 115 mm, or 105% of the original. 5. 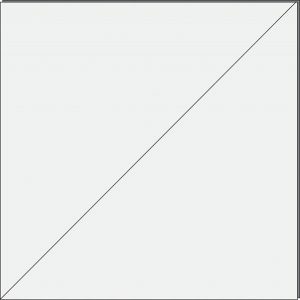 Using a removable marker, mark the center of the white square. Center a white square in an oval hoop. 6. Stitch an embroidery design in the center of each white square. 7. 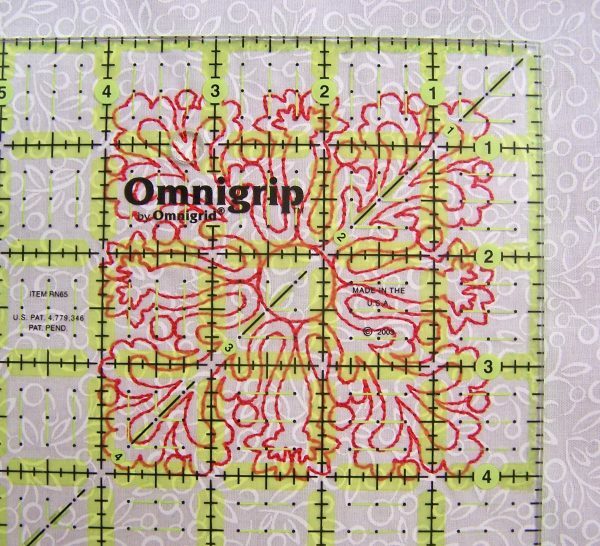 To complete the quilting, I used a walking foot, quilting needle, and red thread to quilt straight lines in the outer borders. 1. Trim the backing and batting even with the quilt top. Stitch the red binding strips together end to end using diagonal seams. Fold and press the resulting long strip in half lengthwise with wrong sides together. Stitch to the quilt front, matching raw edges and mitering the corners. 2. Fold the binding to the back of the quilt and hand stitch the folded edge to the quilt back. I love this wall quilt and imagine making more blocks for a bed size quilt. Thanks for a great pattern!!! Nancy has outdone herself this time. This is both beautiful and inspiring! Just beautiful, thank you for the great tutorial and pattern, I will definitely be making this as a wall hanging for Christmas. Thank you for all of your beautiful patterns and tutorials. I’m ready to start gifts for 2016! This is beautiful ! Thank you so much for sharing it !! Very beautiful! Thank you for step by step instructions, I’m new to my embroidery machine & learning. Very helpful.